In spring and summer, there's nothing better than enjoying a meal outdoors with friends and family; today, al fresco dining has never been more popular, given the rise in popularity of gourmet takeout and prepared picnic baskets. For those who eschew all animal products, though, outdoor vegan meals usually consist of mundane veggie sandwiches and a fruit salad. But no more! 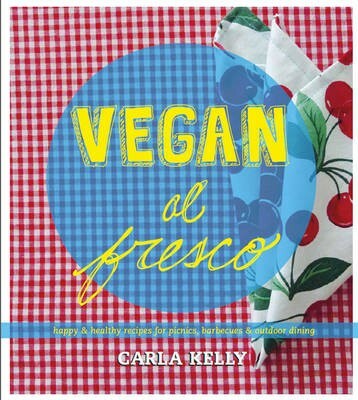 Carla Kelly is an accomplished vegan cook and baker with two previous cookbooks under her belt; she also loves to prepare delicious, casually elegant vegan meals for backyard barbecues, picnics in the park, or parties at the beach. Vegan al Fresco is loaded with beautiful appetizers such as Peanut Potato Salad and Tomato and Olive Tarts, inventive sandwiches including Pita Po'Boys, and amazing grilled dishes like Sweet Chipotle Tempeh with Berries and Cedar Planked Rosemary and Lemon Tofu. Finish off your meal with Strawberry and Basil Scones, Maple and Walnut Cheesecake, or some crazy good vegan ice creams. The book includes prep and cooking times for each recipe, as well as advice on portability, food safety issues, and menu suggestions for special occasions. Full-color throughout, Vegan al Fresco offers delectable and sophisticated ways for vegans to enjoy the great outdoors.